PWC recently released their Total Retail Global Report for 2016, outlining and comparing the consumer shopping behaviours and use of different retail channels, from over 23,000 online shoppers, from 25 different countries across the globe. As an online seller, I’m sure you will agree that staying ahead of the changing eCommerce trends should be a key focus of your business, and this report is designed to help you do just that. Below, we have compiled some of the key takeaways from the findings, and highlighted some opportunities that are available to you, in order to maximise your company’s growth. Consumers were asked how likely they are to purchase goods from overseas retailers, if the seller was offering a better price. As you can see from the image below, the three countries most willing to shop from international providers are Brazil (70%), Chile (71%) and Russia (71%). The fact that two of these three markets are in South America, reflects the shift in consumer behaviour across the continent, which typically comes down to the expansion of consumer credit and increased trust in mobile commerce. This is also extended to Central America, with Mexico also showing a relatively large number of consumers willing to purchase internationally (62%). Overall, there is clearly a substantial opportunity for you to capitalise on these growing markets. What’s interesting is that the three countries least willing to purchase internationally include Germany (36%), the US (36%) and the UK (41%). You should keep in mind, however, that even the lowest percentage – 36% - does still represent a significant amount of customers, particularly given that both the US and Germany have huge populations. For this reason, they should still be considered as part of your expansion plans. With regards to the preferences of other European markets, it really is a mixed bag. While Germany (36%) and France (48%) are at the lower end of the scale, countries such as Poland and Italy saw 66% and 67% respectively. Of the Asian markets that were surveyed, the responses were fairly similar, ranging from 51% to 61%. Ultimately, there is an evident opportunity for cross-border trade in each of these markets, even if some have a larger number of consumers willing to buy from overseas retailers than others. The survey respondents were also asked whether their buying behaviour is influenced by reviews, and the findings show an apparent divide across the globe. Specifically, reviews in many of the European nations are significantly less influential – Denmark (22%), Belgium (23%), France (25%), UK (33%), Switzerland (34%) and Germany (37%) – when compared to several Asian markets - Malaysia (69%), India (66%) and China (63%). 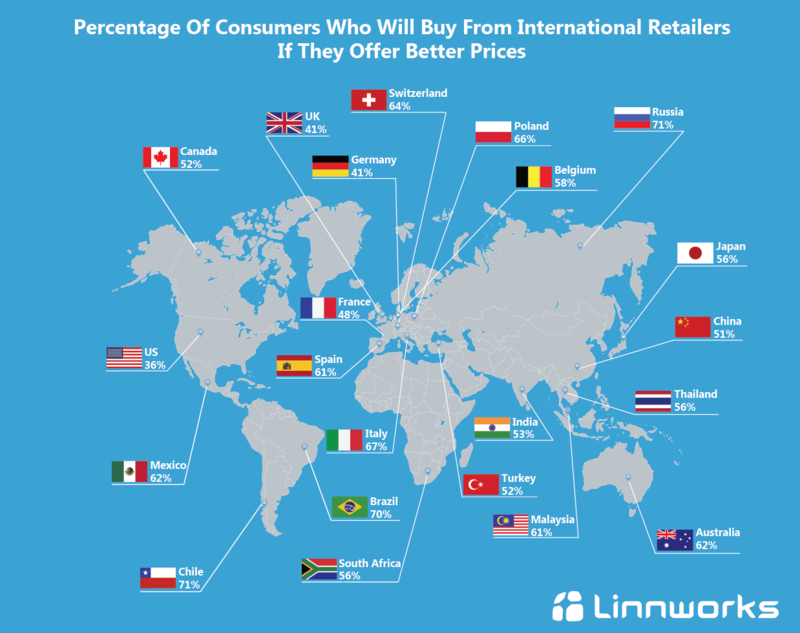 This provides great insight into consumer behaviour and how it differs across the globe, although again it is important to remember that even 22% does still account for almost a quarter of customers who will use these reviews to make a purchase decision. For this reason, you should place a high importance on securing positive customer reviews when selling in any overseas market. Of the respondents who stated that they would purchase from out of country retailers, 51% said they would buy clothing and footwear, making it the most popular category for international purchases. This means that if you are fashion retailer, and you’re not already selling overseas, it’s something you should seriously be considering. In fact, of all of the countries questioned, Russia were the most likely to buy from this category, with 67%. These figures will hopefully give you an idea of just how worthwhile cross-border trade is for your particular industry, although do keep in mind that these figures are a global average, and certain countries will have a higher percentage. Across the world, an increasing number of consumers are using mobile devices to make purchases, which emphasises just how important it is that your site is mobile optimised. The reality is, this is no longer an option, and failing to do so will substantially limit your success online. Mobile commerce does in fact go beyond the use of a smartphone and even a tablet, with more and more buyers using next generation wearable technology such as watches, glasses and pens. What’s also surprising is that more consumers in emerging markets – Brazil, Chile, China, India, Malaysia, Mexico, Poland, Russia, South Africa, Thailand, Turkey and the Middle East – are using mobile devices to make online purchases, than those in established markets. As an example, 56% of buyers in these emerging markets purchase online via a tablet, compared to only 43% of consumers in established markets. In addition, 46% of consumers in emerging markets purchase via wearable technology, as opposed to only 30% of consumers in established markets. Based on these key findings, there are a number of things we would recommend that you do, in order to capitalise on these trends. Do your research – The figures above highlight just how much of an opportunity there is to sell into international markets, particularly in emerging eCommerce markets. As with any business decision, you should always invest the time into researching these countries, the buying behaviour of consumers, and the potential marketplaces available to you to sell on. Additionally, look at the demand for your product in your target markets, and research the competition to get a sense of how well their products perform. Reviews – While the findings show that reviews are more influential in certain countries, the bottom line is that reviews do matter regardless of which part of the world you are selling into. Not only this, but on certain marketplaces, for example eBay and Amazon, reviews can make or break your business, so it is paramount that you are taking the time to improve customer experience and generate high quality reviews. Ensure your site is mobile responsive – Not only are more and more customers in established eCommerce markets turning to mobile devices to make purchases, but the evolution of mobile commerce has also given many consumers in emerging markets the opportunity and accessibility to shop online. Subsequently, if you are not using a fully responsive, mobile-optimised website, you will be losing out on a whole load of potential sales.